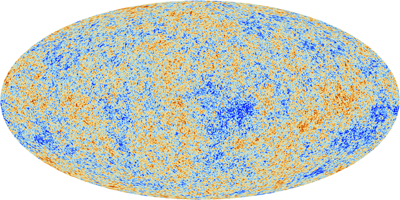 A map of temperature variations of the cosmic microwave background formed from data taken by the Planck spacecraft. Red represents regions that are hotter than average and blue represents regions that coder than average. This cosmic background radiation can be seen all over the sky. In this map the whole sky has been projected onto a two-dimensional oval. Click here for a larger image. Image: ESA and the Planck Collaboration. At night the space between the stars and planets is black to the naked eye. Were you to look at it with a highly sensitive radio telescope, however, you'd see it permeated by a faint and ever-present glow. That glow is the cosmic microwave background (CMB). When Arno Penzias and Robert Wilson detected it in 1964, they thought the effect was down to droppings from pigeons that were nesting in their telescope's antenna. They carefully cleaned the equipment, caught the pigeons and released them some distance away. But the glow remained, and it gradually became clear that Penzias and Wilson had made one of the most important scientific discoveries of the twentieth century. The pigeons paid the ultimate price. When they kept returning the scientists shot them. "It's not something I'm happy about, Penzias is quoted as saying, "but that seemed like the only way out of our dilemma." "The cosmic microwave background radiation is the earliest light we can see in the history of the Universe", explains Hiranya Peiris, Professor of Astrophysics at University College London. "It's the left-over heat from the Big Bang and [provides] a baby picture of the Universe." The reason we can't see this ancient light with the naked eye is that it lies outside of the visible spectrum. It's mostly within the microwave region of the spectrum, hence its name. This animation illustrates how the Planck Satellite made a picture of the CMB. The resulting spherical image is then projected onto the oval picture shown above. The red band running across the CMB in this image comes from light from the Milky Way, which gets in the way of the CMB. However, it is possible to remove this band to get the image above. Copyright: ESA. Indeed, the CMB is the reason we know (or are as certain as we can be) there was a Big Bang at all. At the time of the CMB's discovery another theory for the history of the Universe was competing with the hot Big Bang theory. Rather than envisioning our Universe as having exploded into being from an incredibly hot and dense beginning, the steady state theory saw the Universe as having existed forever. But the steady state theory does not predict the sort of glow in the Universe seen in the CMB. A hot Big Bang Universe, on the other hand, would naturally include radiation left over from its dramatic beginning — Big Bang theory predicts that the CMB should exist. Thus, the discovery of the CMB gained the Big Bang theory near-universal acceptance and Penzias and Wilson one half of the 1978 Nobel Prize in Physics. The CMB radiation originated around 380,000 years after the Universe was born. That may not sound very young, but 380,000 is just a tiny fraction of the Universe's current age of 13.8 billion years. In human terms, the CMB is comparable to a picture of a baby less than one day old. Hiranya Peiris, Professor of Astrophysics at University College, London. It's also the oldest light we can possibly see. For roughly the first 380,000 years the Universe was opaque to light. Free electrons that were not bound to nuclei of atoms were moving through space. Electromagnetic radiation — light — consists of particles called photons, and these were scattered by the electrons as they bumped into them. "It's a bit like sunlight on a cloudy day," says Peiris. "You can't see past the clouds because the light gets scattered." As the Universe expanded, however, it also cooled down, a process that favoured the formation of neutral atoms. Electrons were now bound to the nuclei of these atoms. They were no longer free and the photons were no longer scattered. "Since then the photons have been propagating to us without interacting with anything, until they got eaten by our detectors," says Peiris. "It's a long, lonely journey carrying messages from the very early Universe." And while we can't see the CMB radiation directly, we don't need to own high-tech equipment to detect it. An old TV is enough: about 1% of the static on an old and untuned TV screen comes from CMB radiation. To really decipher the CMB messages, however, you do need more sensitive measuring equipment than an old TV. The Earth's atmosphere absorbs much of the CMB radiation, so if you want to measure it from down here you need to go to high and dry places: the Antarctic, for example, or the Atacama desert in the Andes. 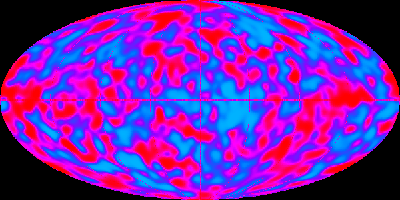 A map of temperature variations of the CMB formed from data taken by COBE. Image: NASA Goddard Space Flight Center and COBE Science Working Group. Another solution is to go into space. In the 1970s NASA initiated the Cosmic Background Explorer (COBE) project; a plan to measure the CMB radiation from a satellite. Over a thousand people got involved, but the launch was delayed by the tragic accident of the Challenger space shuttle in 1986, which exploded with its crew on board. The accident delayed further shuttle missions, including the one that was to carry COBE. Eventually, though, COBE was given its own rocket and was launched into orbit in 1989. The results COBE delivered were amazing. Big Bang theory predicts that the early Universe should have been a perfect black body: an object that emits as much radiation energy as is possible for each frequency of the radiation. The shape of the spectrum of this radiation would only depend on its temperature. Within minutes of receiving the data from COBE it was clear that the CMB radiation did indeed have this black body form; in fact it is the most perfect blackbody spectrum ever recorded. When the curve for the CMB spectrum was shown at an astronomy conference in January 1990, the results received a standing ovation. But there was more. When the messenger radiation first set off on its journey, 380,000 years after the Big Bang, it was hot: around 3000 degrees Kelvin — that's over 2700 degrees Celsius. Since then it has cooled to around 3 degree Kelvin (around -270 degrees Celsius). On top of that 3 degree average, however, tiny fluctuations in temperature occur across the sky. COBE was able to pick up these fluctuations. 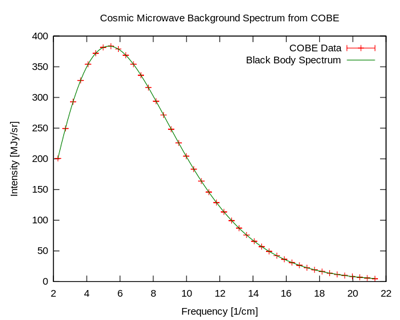 Graph of the cosmic microwave background spectrum measured by COBE. The horizontal axis represents the various frequencies of radiation and the vertical axis the intensity of the radiation at that frequency. The spectrum is so close to that of an ideal black body, it is impossible to distinguish the observed data (red) from the theoretical curve (green). The fluctuations of temperature explain why structures like stars and planets were able to form. If the Universe had been filled by a smooth particle soup at the time the CMB photons began their journey to us, with matter smeared out evenly, then the radiation would have the same temperature everywhere. The temperature variations indicate that the Universe was a tiny little bit lumpy: there was a slightly higher density of matter in some places than in others. Physicists have worked out how the CMB photons would be affected by tiny lumps of matter in the early Universe, and also by their journey towards us, so they can infer the nature of the early lumpiness from the temperature fluctuations in the CMB picture. "The tiny [density] fluctuations are what everything in the Universe grew from." explains Peiris. Matter attracts more matter through gravity, so the tiny variations eventually grew into the stars, planets and galaxies we see today — and us. "This is why, when the fluctuations were discovered, it was a Nobel Prize," says Peiris. The fluctuations show that the seeds for all the structure we see in the Universe were there right from its beginning. The 2006 Nobel Prize in Physics was awarded to John Mather and George Smoot, who both played important roles on the COBE project. Stephen Hawking described COBE's results as the "the greatest discovery of the century, if not of all times". But what COBE, and later missions such as WMAP and Planck, have told us is a lot more than we have explained here. "The CMB is the cornerstone of our [current understanding] of cosmology — all aspects of it," says Peiris. To find out how a simple picture can provide so much information, read The cosmic soup. 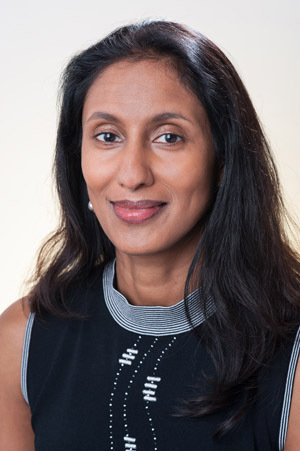 Hiranya Peiris is Professor of Astrophysics at University College London. She was interviewed by Rachel Thomas, Editor of Plus in July 2017. Marianne Freiberger is Editor of Plus. Measured Results are Too Good? The agreement with the theoretical curve is indeed remarkable, and perhaps too good. Do you remember school lab experiments doing things like measuring Ohm’s Law. There always was a great temptation (for others!) to adjust their results to better fit with the (“known correct”) predicted results. If that happens with no financial considerations, imagine how much pressure there is in these Big Science experiments where the future funding is critical to everyone’s jobs. Does anyone remember Diesel emission testing? Again big money involved, and software tweaked to get better answers. I don’t know, I just have a concern. There was some guy (whose name I have forgotten) who wrote about the results with great passion, although he did have an obvious agenda. Nevertheless he stated that the COBE results did include (to the best of my recollection) something like 1000 correction terms. If you know the “correct answer” it is pretty easy to find errors which move the result in the desired direction. This can easily be an unconscious bias, so I am not accusing anyone of malpractice. It is just a concern of mine. Then there is the problem with a null-sensing system at low cryogenic temperatures. Whilst I have never myself worked at cryogenic temperatures, I did design, build, and test room temperature mmwave radiometers for a living for 12 years. The equations suggest that they get very insensitive at low temperatures. This is a non-obvious result, and it is not clear if this was known to the investigators.